Kristov Martinez named First Team AFCA All-American. 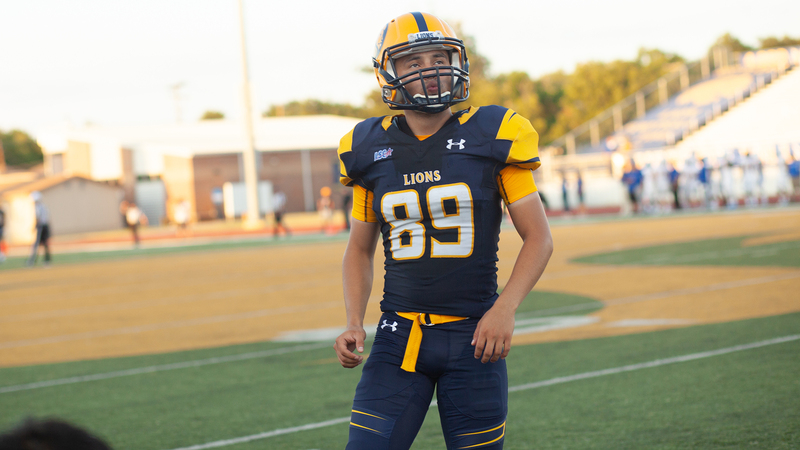 WACO – Texas A&M University-Commerce kicker Kristov Martinez has been named a first-team All-American by the American Football Coaches’ Association, as announced Wednesday. The senior kicker finished his Lion career as NCAA Division II’s all-time leading kick scorer with 449 points. This places fourth in scoring among all college players in the state of Texas. The LSC’s all-time leading scorer earns All-American honors for the second time, elevating to the first team for the first time. He was a Don Hansen’s third team All-American in 2017. He was 21-of-26 on field goals with a career-long of 55 yards in the regional semifinal at Tarleton. He also made all 48 PAT attempts on the season and ended his career with a streak of 103 PATs made in a row. He was also fantastic in the kickoff phase, as the Lions finished the season ranked No. 1 nationally in kickoff coverage. Martinez’ selection to the AFCA All-American team extends A&M-Commerce’s streak of six straight years with an AFCA All-American. This is the longest active streak in the nation. All-time, the Lions rank second in Division II with 23 AFCA All-American selections. DL Austen Eskew 6-4 248 Sr. Northwest Missouri St.
WR Shane Zylstra 6-5 220 Jr. Minnesota St. Team Background: The five teams now chosen for each AFCA division evolved from a single 11-player squad in 1945. From 1945 until 1967, only one team was chosen. From 1967 through 1971, two teams – University Division and College Division – were selected. In 1972, the College Division was split into College I and College II. In 1979, the University Division was split into two teams — FBS and FCS. In 1996, the College I and College II teams were renamed Division II and Division III, respectively. In 2006, the AFCA started selecting an NAIA-only team. From 1965-81, a 22-player (11 offensive, 11 defensives) team was chosen. In 1982, a punter and placekicker were added to the team. In 1997, a return specialist was added, giving us the current 25-player team. The return specialist position was replaced by an all-purpose player in 2006. In 2016, the AFCA added a second-team All-America. Selection Process: The AFCA’s Division II All-America Selection Committee is made up of three head coaches from each of the AFCA’s seven districts, one of whom serves as a district chairman, along with another head coach who serves as the chairman of the selection committee. The coaches in each district are responsible for ranking the top players in their respective districts prior to a conference call between the district chairmen and the committee chairman on which the teams are chosen.